Less than a week into his time as athletic director at the University of Kansas, Jeff Long is bringing a fresh approach to how the department will handle its long-struggling football program. Long announced Monday the hiring of Mike Vollmar, a former associate athletic director for football at Alabama and Michigan, as KU’s senior associate AD for football administration. "I am pleased to add an administrator of Mike's caliber and experience to our staff," Long stated in a KU press release. "He understands college football at the highest level and has experienced considerable success at that level. After my initial evaluation of the department, we felt we needed to make a stronger commitment to our largest program in terms of student-athletes. I am confident Mike will provide outstanding day-to-day support to those student-athletes, to Coach (David) Beaty, the assistant coaches, the staff and to our administrative team." Vollmar served as director of football at IMG Academy in Bradenton, Fla., before accepting the position at KU, which he is scheduled to start on Monday, Aug. 13. He joined IMG this past February after serving four years as the University of Tennessee's senior associate athletic director. There, Vollmar oversaw football and was a member of the Vols' executive staff. From 2011-12, he worked at Michigan, as the Wolverines made two bowl appearances, highlighted by a 2011 BCS Sugar Bowl championship. Vollmar also was involved in the planning and design of the $9 million renovation of Schembechler Hall, which houses Michigan football's training facilities, as well as a museum dedicated to the historic program. While at Alabama, from 2008-10, Vollmar worked with head coach Nick Saban as the Crimson Tide went 36-5 and won the 2009 national championship. Earlier in his career, from 1996 to 2007, Vollmar was assistant AD and director of football operations at Michigan State. He was responsible for managing all phases of the Spartans’ football program while also overseeing construction of a new $12 million football facility. Through the years, Vollmar has been involved with programs as they went to 20 bowl games, won a national championship and achieved four conference titles. "I can't wait to get started at KU," Vollmar stated in KU’s release. "Great things are happening at IMG Academy. It's a world-class institution with a one-of-a-kind atmosphere. I am excited, though, to come back to my first love – college football – especially at Kansas, which has so much potential. Over the years I've been impressed with everything I've heard about the university, the athletic department and the community. I want to help the student-athletes and the coaching staff accomplish the success they're working so hard to achieve." Vollmar also served on the College Football Playoff Advisory Committee and was a member of the Rose Bowl Advisory Committee. He serves as a trustee on the American Football Coaches Association's National Committee for Directors of Football Operations. Additionally, Vollmar took on recruiting and administrative positions with Syracuse (1991-95) and Michigan (1988-90). At Syracuse Vollmar was responsible for the oversight of recruiting and administration. Four players recruited during his tenure, including Donovan McNabb, were named to the Syracuse All-Century Team. At Michigan he served in athletics administration and was assistant recruiting coordinator. During that span Michigan went 28-7-1, winning three Big 10 Championships while appearing in two Rose Bowls and a Gator Bowl. Beaty, entering his fourth season at KU, said he is pleased to have Vollmar on board. "His experience at elite-level football programs speaks for itself,” Beaty stated. “We are looking forward to him getting to know our staff and players, and working hand-in-hand with him as we move the program forward." The KU athletic department’s staff directory currently lists senior associate athletic director for compliance and student services, David Reed, as the supervising AD for KU football. 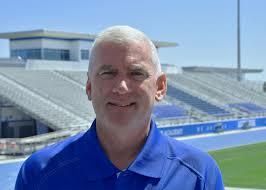 As director of football at IMG Academy, Vollmar oversaw all aspects of the football program, including boarding school, camps, visiting team training and events. Vollmar graduated from Siena Heights University in 1988 with a degree in history and a minor in speech communications. He was a pole vaulter for the Saints' track and field team. He earned a master's degree in sport management from the U.S. Sports Academy in 1989, where he was named Alumnus of the Year in 2010 and serves on the Alumni Board. A native of Riverview, Mich., Vollmar’s father, James, was a running back at Michigan from 1956-58. Mike graduated from Riverview High School, the same school that produced former Michigan head coach Lloyd Carr, former Vanderbilt head coach Woody Widenhofer and former Colorado head coach Bill McCartney. Mike and his wife, Tami, have a daughter, Bailey, who is a student at Michigan State University. Is it sad that since Saban has taken over, I can’t remember anyone outside the SEC (other than Clemson) being in the NC? Not that the noose isn't already tight enough around Beaty's neck, but the chair he's standing on seems to get shorter with these kinds of football hires. Feels like only a Bowl appearance will provide a stay of execution. I don't think Beaty has what it takes to lead this program. I think it was proven with the firing of Zenger and his two hires which both failed miserably. Beaty isn't cut out to be a head coach and his 3-33 record is only more proof of his inept ability. "Feels like only a Bowl appearance will provide a stay of execution." BTW Joe. How's Perry Ellis doing fulfilling your pre draft prediction that he's the same player as Harrison Barnes? Is an NBA max deal imminent? Has he begun playing the same position? Developed a real jump shot? Actually, Joe's comment is probably the best one on this thread. With all the extraneous stuff about Perry Ellis, it just sounds like you have an axe to grind. Really? A 6-6 season wouldn't keep Beaty around? Seriously? If you really believe that you must be as deranged as the rest of the clowns. Proof of the widespread derangement? Actual people seem to have liked Joe's nonsense post. This seems like a good idea to me! I really like this hire. And maybe they have realized that football has gotten relatively little administrative support during their struggling years and have decided to give them some. Buhbye. Long should do this for the WBB program too. Bring in someone from an analyst from a powerhouse like Tennessee or UConn. Then - buhbye to that coach too. Well someone who worked at Tenn, Alabama and Mich should have a good idea on how to turn things around. I doubt that they will take the coaching search lightly. I'm very optimistic and hopeful. Great article. Thank you for posting. While some what depressing (of course the recent decade has been AWFUL but the football program overall is disappointing) towards the end of the article I see quoted, "That's the job I want," said one coach with extensive Power Five and NFL experience. "I have circled Kansas. I have been researching it." I wonder who that might be? This is nothng short of leadership preparing for serious identification of high quality coaching applicants and less about evaluation of the current coach. Only a bowl game this year would appear to prevent a coaching change. I tend to agree with Joe’s comment above. Last week I said word on the street was a football consultant was on the way to the program. He has arrived. Could the head coach replacement in Long's front pocket be far behind? I think not. Quid Pro Quo Clarice, Quid Pro Quo. 10:01 pm Sept 1st is the over/under. Buckle up my friends because Kansas football is about to get real interesting. I agree, with the caviat that "real interesting" doesn't necessarily mean better...at least not quickly. Kansas is in a HUGE hole. There are probably 2 or 3 men that could make Kansas competitive in the Big 12 within 3 years (a Nick Saban at Kansas, for example, would draw recruits...only he's not coming here). To everyone else, Kansas looks like Humpty Dumpty. "It's gonna take tiiiime...a whole lotta precious time...to do it right, child." "And it's gonna take money...a whole lotta spendin' money...mmm...to do it, to do it, to do it, to do it, to do it, to do it right!" I'm recalling an article about the change in the football program that Saban brought with him from his failed trip to the NFL: more admin staff. Still the same number of coaches coaching but the coaches spent a lot less time administrating and more time actually coaching. Regardless of the HC a commitment greater than facilities is needed to be successful. Has KU ever has a senior associate AD? How much does this cost and who is paying for it? They mention the previous three colleges....and yes they have football pedigree, however, they had that pedigree before he was there. He himself was not responsible for Alabama winning a NC. He was present for it. He helped in some fundraising....I believe the largest mentioned was 12 million. A far cry from the 350 that we need. Was never a coach or assistant. Not sure the point of the hire. What exactly is he going to do? Before we get all excited about what schools he has come from, let’s remember that we had 2 football players from Alabama and a coach from Norte Dame. Pretty good pedigree and nothing to show for it. Donors pay for it. like nearly everything else in the athletic department. While some one wasn't around for the "building" of an organization doesn't mean they are unable to observe what works and add it to their took kit. To...the more bodies from successful atmospheres we can inject in the KU program, it can't do anything but help. Even if they had the pedigree prior to his arrival, it still means something to bring someone in who has witnessed what success looks like. His value may come in implementing here what he has seen work in other places. So this is a valid perspective even if his contribution at those places was zero, which is far from proven. With regard to who has raised 350 million, that is undoubtedly a short list. Keep in mind that everyone who IS on that list was at one time a person who raised nothing at all. It's not as if he can't be useful in raising money if given the chance. What is our standard of "success" at Kansas? No embarrassing, historic streaks of ineptitude? 3-4 wins a year consistently? Bowl eligibility half the time? Going .500 in the Big 12? Achieving what Mark Mangino did 10 years ago, and making it to a major bowl? Winning a major bowl game? The point is, "success" could be defined in any of the above ways, and many others between or not mentioned. Two things are sure: one, it won't happen overnight. Even if the stars align and we get "the right coach" (if Beaty fails), goals are going to be modest from year to year. Secondly, if we ever DO climb out of this hole, Long is going to have a 12-foot statue carved in his honor placed conspicuously at a major-intersection-turned-roundabout-so-everyone-can-see-it in Lawrence, Kansas. I like your starting definition of "competitive". What it would mean if other teams had to play their starters the whole game is that Kansas would be playing at a certain level. I think fans for the last 10 years have been willing to sacrifice the W's to see competitiveness as you define it here. The problem NOW is that future conference realignment rumblings might make Ws more necessary in the short term, or the picture of Kansas football might have us in the same compromising position that we were in during the last round of it. I would have argued that if both Zenger and Beaty were in place at this point, that we would have been in far worse position than we were in during the last shake-up, by virtue of the fact that the streak of ineptitude of Kansas football has been extended and would have undoubtedly played in the minds of other conferences. Long's hire and the creation of this position for football will shift thinking if and ONLY if it translates to increased donations, the hire of a capable coach, and results that are evident within a season of his arrival. If that coach is any one of the above men, then more power to him. Also agree about the lack of excuses. We can't make any more while we kick the can down the road. The new coach's attitude and performance should reflect the fact that we need to see improvement NOW. If we don't think a coach is capable of that, then we need to move on to someone else. At the time, Turner Gill was not a bad hire. His 20-30 record alone doesn't tell what Buffalo was prior to his hiring. Buffalo was in basically the same position KU is in now as the worst program in the FBS. They hadn't won more than two games in a season since they had moved up to the FBS before Gill was hired. Turner Gill won 5+ games in each of his last 3 years there and won their first conference title and took them to their first ever bowl game. He may have ended up being a bust, but there were many analysts who thought he was a very solid choice to take over after Mangino. I think 'standard of success' will be an evolving standard. No one would expect that we will be in the top 25 within the next two years. However, I think it is reasonable to get to your "Bowl eligibility half the time" That's only 6 wins. Most KU fans would be over the moon with that given what we have experienced for the last 10 years. However, if we look back to the Mangino years, bowl eligible was starting to look like a low standard.......we evolved. Get someone that can bring us back to respectable. Fans will be happy. Donors will see progress. Then get to .500 in Big 12 play. Fans will be happier and donors will be even more open with the checkbooks. Start winning bowl games, get to .750 in Big 12 play........etc, etc. I like the path in front of us. There's no reason KU shouldn't get to a bowl game 75-80% of the time. KU could never have a winning league record and still make it to a bowl game every year. A 3-0 nonconference record means KU only has to go 3-6 in league play which is still going to be bottom third of the league every season. A 2-1 nonconference record means a 4-5 B12 record to get to a bowl game. Shouldn't be difficult to do, but KU keeps finding new ways to fail. So does this mean other senior people at the KUAD are now expendable? Lester has been the main administrator for Kansas Football during the Decade of Despair so should he walk the plank. I’m not sure what your waiting for. Go on and fire Coach Beaty. It’s a no win situation for the man. KU will NOT make a bowl game. Any realistic fan understands that. What has KU done for you to even imagine that they win 6 games this year to be bowl eligible. That means winning on the road. We haven’t won a road game in 10 years. It is what it is. Fire the man and move on. Pick your guy and let’s get going. What a waste of a season. No motivation for this team or recruits knowing that Beaty has NO chance. This decision not firing Beaty now to me has implications on this program for at least 3 to 5 years before you start to see any progress. I like Beaty. I wish he would have succeeded. I tend to agree however, that unless he reaches a bowl game he's out. We're not getting to a bowl game this year. We have two committed recruits; others would be silly to commit with all signs pointing to a new coach at the end of this season or sooner. Just let him go as soon as a new coach is identified as "the one." Otherwise, we'll go into next season in a position worse than when Beaty was hired with regards to the number of scholarship athletes. In my opinion, you can only fire the coach before the season if you have your new coach currently sitting on the sidelines and ready to take over now. I doubt that is the case for Long. Firing Beaty now and just putting in an interim I think looks really bad to prospective coaches which narrows the resume pool. Beaty is coaching his seniors this year and there is a very reasonable expectation that a coach starting his fourth year should at least win this easy non-conference schedule. If he even goes 2-1 then firing would seem much more reasonable to our next prospective coach and help us have a larger pool of resumes to sort through. I do think if he is showing the same signs of failure (his not the players) we've seen the last three years on the sideline then midseason firing and interim coach from within is actually an advantage in recruiting next coach. Not deranged. I sat in a cold Orange Bowl Stadium and watch us win a great game with effort, guts, heart, and great coaching. I would like to do that again before I die and any and all of the previous regimes can leave today so we can get on with it. Dennis...no need to raise your hand when you're called. You know who you are. Honestly, reading Vollmar's full resume......if he would have been hired as KU's AD, it would not have disappointed me. That kind of experience in running football has been lacking here. I'm VERY happy we got long, and that he could bring in a leader for the football side of the house says a lot about his power in the business. We need to win all non conference games and 3-4 conference games, and get to any bowl. That is competitive and successful to me. Losing in conference by 30 points is not. Beaty has had his chance. Last year going backwards was the final straw. I don't think he survives into conference play. Welcome Mike to Lawrence!.....I am familiar with your career....Everest awaits.....Get Gene Chizik on the phone! I am excited to see anyone from programs that have been successful come to KU, to change the culture to that of a winning program. What I don't understand is what exactly an Associate AD of Football does? I know someone else asked above, but don't think he got a real answer. The coaches coach and recruit. The AD hires coaches, coordinates fund raising efforts, and handles the budget. You obviously need an associate AD or places like Alabama and Michigan wouldn't have them. I think he is an Associate AD but is in charge of football. A lot of colleges have Associate AD's that are sport specific. For instance UCLA has 13 associate athletic directors in charge of various sports and areas with in the department. The inability of Beaty to recruit this season must be affected in large extent to recruits' perceptions about how long Beaty is going to be around. Actually, Beaty is caught in a cross-fire. He can't recruit this year. And the lack of high-level commits makes it easier to get rid of him (because in all likelihood, good recruits would de-commit if the coach were fired...only there are practically none of them). Could we please recruit some of those IMG studs.